going South. Leave at exit AFFI – pass the first traffic circle. At the 2nd traffic circle leave at the 2nd exit towards Peschiera. 3rd exit on the interstate is the exit for Lazise. At this exit turn right towards Lazise. Follow the signs. 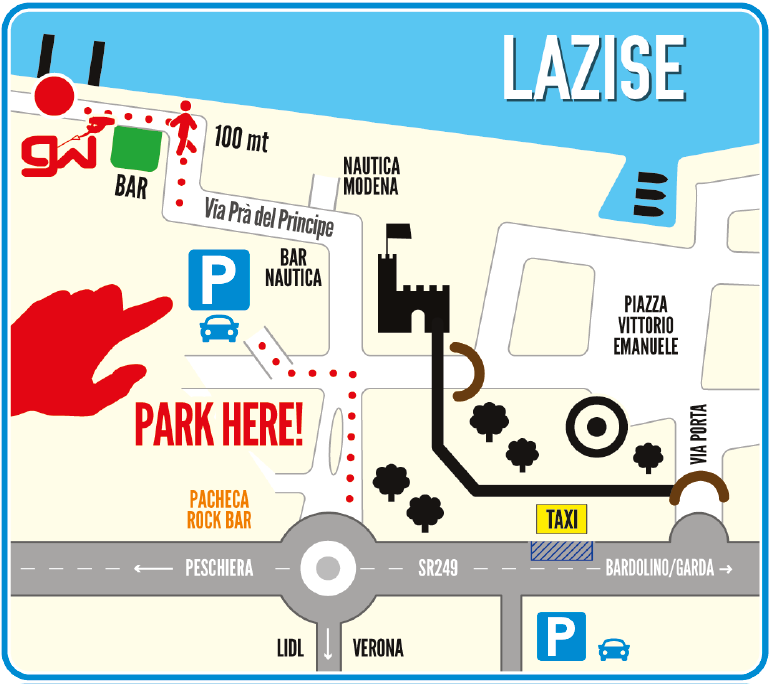 Leave the traffic circle in Lazise at the 2nd possibility and take one of the big parking of charge. Pass by foot the Nautica Modena (leave centre of town to your right) where you will find a pedestrian walkway which will lead you directly to the beach. After another 100 m at the beach you have found us. Done! leave the Lazise traffic circle at the 3rd opportunity towards Peschiera. The campground is located 200m on your right! Advance booking may be required. All activities are at your own risk!